We create beautiful and functional websites for printers that drive sales and make managing your print shop more profitable and efficent. Are you ready to compete with the big boys? Our online designer has been delevoped over several years and is easy to use and has all the feature your customers expect. Our web to print software allows you to view and process all your orders in one easy to use platform, print worksheets, add notes, schedule production. Need to automate shipping or have special functions the other guys dont offer, we can build them into your site. You and your customers will be able to view your site, design online and place orders form any connected device. Say goodbye to the cookie cutter websites, layouts and feature that everyone esle has. We make the site the way you want it. Web to print storefronts for your customers. Fully customer managed and available profit sharing. Sheetfed offset shop, screen printer, sign shop or promotional products distributor, our solution works for all. We can make your website look however you want. Check out our plans below. All Plans include high speed scalable hosting on Google Cloud, website customization and can be upgraded, downgraded or canceled at any time. Please contact us with any questions. Perfect for startup shops and printers looking to start with eCommerce. Perfect for shops looking for a major website upgrade. Perfect for shops with multi decorating capabilities or print brokers/PPDs. Check out some sites we have made. They make Millions. We used to be another local print shop, now we are THE print shop in town. Having a high end site changes the way your customers look at you, the new site is like the fuel that powers our growth. thanks web2ink! Web2ink changed our business, we literally get orders and do them with out ever talking to the customers. We like to connect with our customers, but this is awesome. 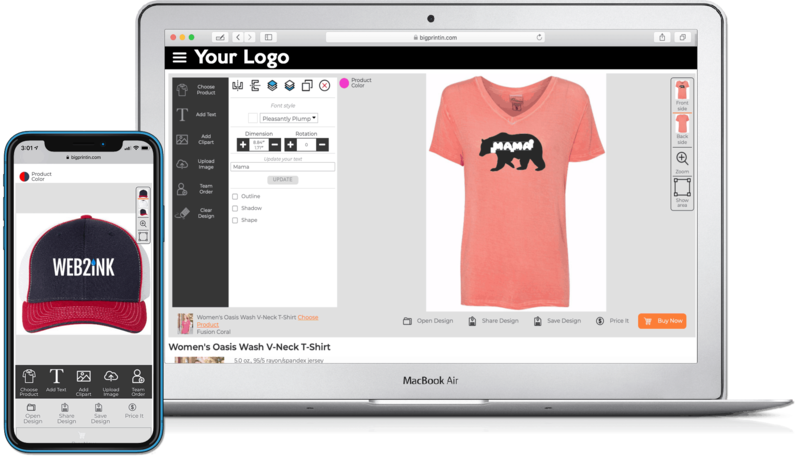 We needed very specific functions, In the sports apparel market we needed personalization options for names, numbers, and putting numbers on tops and bottoms to match, web2inc provided that in a platform our customers enjoy.